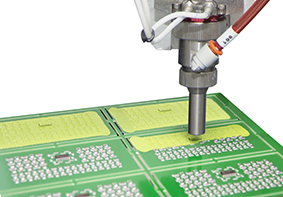 Electrolube’s new UV cure coatings are designed to offer the highest level of protection for electronic circuitry with an exceptionally fast processing time. The range features UVCL-P, which is the Plus version of UVCL. It is a transparent, flexible coating that is extremely resistant to thermal shock. The main benefits of UVCL-P are the improved coverage and protection achieved, along with a guaranteed chemical cure in six hours thanks to its innovative secondary cure mechanism. Selectively applied at 50-150 microns thickness, the Plus version will always afford a higher level of condensation protection than UVCL when sprayed at the same thickness. UVCL-P has a higher maximum operating temperature of 150°C and meets the requirements of UL94V-0 at thicknesses below 150 microns and can be cured with either 365nm LED lamps or ‘D’ bulb microwave technology. Electrolube has also developed an ‘xtra’ version of UVCL, called UVCL-X, which shares the benefits of UVCL-P with excellent resistance to thermal shock, immediate board handling with a guaranteed chemical cure in six hours thanks to the unique secondary chemical cure mechanism and exceptional coverage and protection. Reflecting its environmental credentials as well as increasing the ease of inspection, UVCL-X is a green-opaque coating that can be applied at up to 300 microns and has a higher maximum operating temperature of 150°C. It is a highly flexible coating that demonstrates excellent thermal conductivity, 0.7 Wm-1K-1 for significantly improved heat dissipation. The coating is also UL746 qualified and meets the requirements of UL94V-0 at thicknesses below 300 microns. Further UV cure coating products, also featuring secondary moisture cure, have recently been launched. These include a new film coating product, UVCL-FC, which enables the application of even thinner coatings and faster curing line speeds. UVCL-FC is a low viscosity, fast-curing UV formulation for rapid processing. The company has also introduced a new UV cure coating specifically for LED applications. The UVCL-LED coating is also a low viscosity coating that enables rapid cure with low energy 365nm LED lamps.